It was Christmas Eve and my husband and I were asked to sing in the choir. My right foot fell asleep during practice, but that was the least of my worries. We were singing “Angels from the Realms of Glory” and I learned we would not be using music. I realized I’ve played the carol many times, but I have never sung it. Luckily, they would have the words on the projector screen…but the monitor blocked part of the screen from my view. I fumbled through that carol, singing softly, and thought I was home free. I was wrong. When we came back on the platform for the next two carols, I found I was having trouble walking. I was trying desperately not to limp. Of course, when I went to find my seat for the sermon, I could not find my husband. Someone had taken our seats and he sat down in the front. I walked to the back of the sanctuary before an usher caught up with me. She led me to the row my husband was seated in. All I wanted to do was put my foot up on the back of the seats in front of us. I put it on my knee instead. I decided the problem was my shoes needed replaced. I don’t have many shoes. I alternate between white and black athletic shoes during the week. I also have one pair of hiking shoes because they were on sale. I purchase shoes in January and July. Usually, I buy one pair of white walking shoes and one pair of black walking shoes. In the summer I wear the white shoes the most and black shoes in the winter. It is easy to forget which pair is oldest. I decided to write the date I purchased the shoe on the inside of each. I threw away the oldest pair. 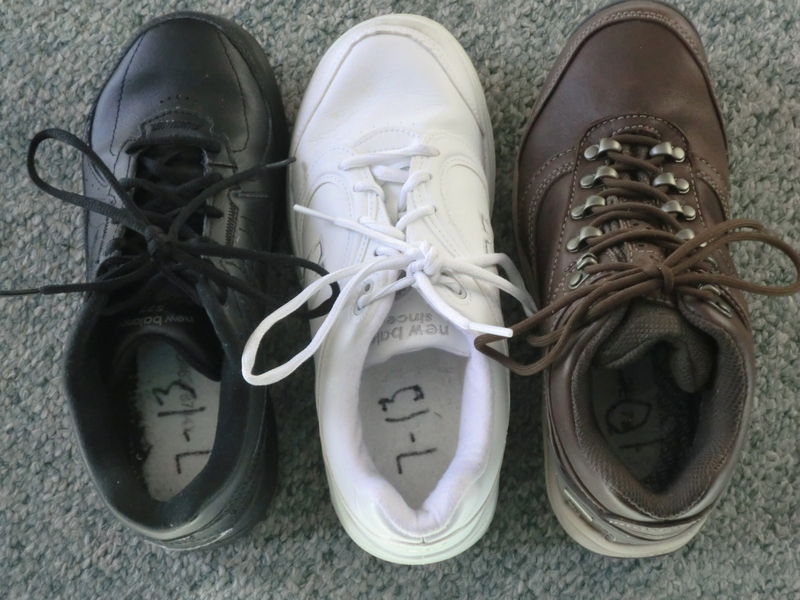 Write the date you bought your shoes on the inside. The next service it was bitterly cold again. I pulled out my trusty snow boots and wore them to church. I was shocked when my foot fell asleep again. I pulled off the boot and looked at the size. They were a 7 1/2 wide and I need 7 extra wide or EE. It wasn’t the shoes…it was the boots. I went online and ordered snow boots in the correct size. Since it is so late in the season, I couldn’t get black or white…I got shiny purple ones. I’ve gotten a lot of compliments on my boots; after all, you can’t miss them. I listened to my body for the last three weeks as I fought an infection that took three antibiotics to kill. That was followed by a 4 day migraine. I rested instead of writing. I was so sick that I only got up to change my pajamas that first week. Anyone miss me? This entry was posted in Clothes, Health and tagged Clothes, Health by Frugal Fish. Bookmark the permalink. Yup! I was wondering when I’d see a post from you again :) Hope you are well and recovered now! Our family has also been dealing with a nasty bug, but we are all in recovery mode now. How awful! At least we were able to keep my infection from spreading to others. I hope your family bounces back soon.